While it's been weeks since a new case of a food-borne illness has been linked to a Chipotle restaurant, the fast casual burrito chain appears to be off to a bumpy start this year with reports of declines in sales, a federal investigation, and lawsuits related to last year's high-profile E. coli outbreaks. 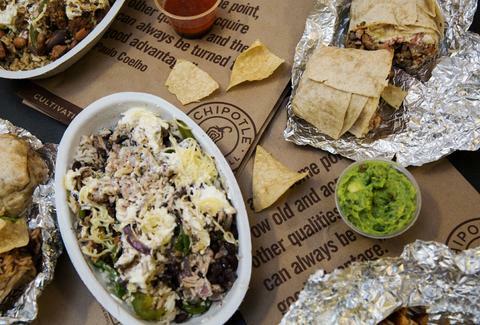 But as reported by CNBC, Chipotle is looking to bounce back this year, starting with more free food for customers. During an interview on Wednesday at an investment conference, Chipotle's co-CEO Monty Moran said the company has actually doubled the amount of free food that its restaurants are able to give to customers. However, executives wouldn't reveal each store's allowance for freebies or how customers are able to get their hands on free burritos, which suggests it's likely at employees' and managers' discretion rather than a promotion like the popular $3 burrito Halloween deal. As CFO Jack Hartung explained, the free food budget is actually an old practice, saying, "We've always had it, but it just kind of drifted to such a low-grade level that it was kind of non-existent." Chipotle also plans to launch a new marketing campaign aimed at winning back customers' trust, according to a report by USA Today. "We're going to be making an unprecedented effort to reach out to our most loyal customers with a detailed story about what happened," said Mark Crumpacker, Chipotle's chief creative and development officer, per the paper. "Chipotle is known for being very transparent, and we intend to continue that." And on top of that, The Wall Street Journal reports that Chipotle will close all of its stores for a "few hours" on Feb. 8 for a what's presumably a companywide meeting regarding E. coli. Employees will hear from executives, who will reportedly share what they know about how the E. coli outbreak occurred as well as the company's plan to make sure it doesn't happen again. In the meantime, handing out free food is probably a good start. Tony Merevick is Cities News Editor at Thrillist and, as always, thinks food tastes even better when it's free. Send news tips to news@thrillist.com and follow him on Twitter @tonymerevick.